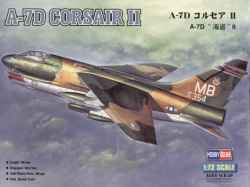 Excellent from Hobby Boss of the A-7D Corsair. Featuring 188 parts, it has to be said that the detail on this 1/72 scale kit is better than many larger scale kits. A-7D, 353rd TFG, 254th TFW, Thailand, 1972. A-7D, 162nd TFS, 178 TFG, Ohio ANG.